"Double vision" redirects here. For other uses, see Double vision (disambiguation). Diplopia, commonly known as double vision, is the simultaneous perception of two images of a single object that may be displaced horizontally, vertically, diagonally (i.e., both vertically and horizontally), or rotationally in relation to each other. It is usually the result of impaired function of the extraocular muscles (EOMs), where both eyes are still functional but they cannot turn to target the desired object. Problems with EOMs may be due to mechanical problems, disorders of the neuromuscular junction, disorders of the cranial nerves (III, IV, and VI) that stimulate the muscles, and occasionally disorders involving the supranuclear oculomotor pathways or ingestion of toxins. One of the first steps in diagnosing diplopia is often to see whether one of two major classifications may be eliminated: both may be present. That involves blocking one eye to see which symptoms are evident in each eye alone. Binocular diplopia is double vision arising as a result of strabismus (in layman's terms cross-eyed), the misalignment of the two eyes relative to each other either esotropia (inward) or exotropia (outward). In such a case while the fovea of one eye is directed at the object of regard, the fovea of the other is directed elsewhere, and the image of the object of regard falls on an extra-foveal area of the retina. The brain calculates the visual direction of an object based upon the position of its image relative to the fovea. Images falling on the fovea are seen as being directly ahead, while those falling on retina outside the fovea may be seen as above, below, right or left of straight ahead depending upon the area of retina stimulated. Thus, when the eyes are misaligned, the brain will perceive two images of one target object, as the target object simultaneously stimulates different, non-corresponding, retinal areas in either eye, thus producing double vision. This correlation of particular areas of the retina in one eye with the same areas in the other is known as retinal correspondence. 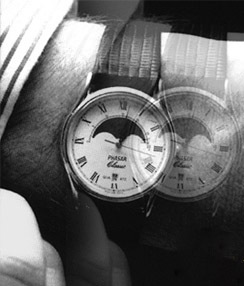 This relationship also gives rise to an associated phenomenon of binocular diplopia, although one that is rarely noted by those experiencing diplopia: Because the fovea of one eye corresponds to the fovea of the other, images falling on the two foveas are 'projected' to the same point in space. Thus, when the eyes are misaligned, two different objects will be perceived as superimposed in the same space. This phenomenon is known as 'visual confusion'. The brain naturally guards against double vision. In an attempt to avoid double vision, the brain can sometimes ignore the image from one eye; a process known as suppression. The ability to suppress is to be found particularly in childhood when the brain is still developing. Thus, those with childhood strabismus almost never complain of diplopia while adults who develop strabismus almost always do. While this ability to suppress might seem an entirely positive adaptation to strabismus, in the developing child this can prevent the proper development of vision in the affected eye resulting in amblyopia. Some adults are also able to suppress their diplopia, but their suppression is rarely as deep or as effective and takes much longer to establish, and thus they are not at risk of permanently compromising their vision. Hence, in some cases diplopia disappears without medical intervention, but in other cases the cause of the double vision may still be present. Certain persons with diplopia who cannot achieve fusion and yet do not suppress may display a certain type of spasm-like irregular movement of the eyes in the vicinity of the fixation point (see: Horror fusionis). Diplopia can also occur when viewing with only one eye; this is called monocular diplopia, or, where the patient perceives more than two images, monocular polyopia. While there rarely may be serious causes behind monocular diplopia symptoms, this is much less often the case than with binocular diplopia. The differential diagnosis of multiple image perception includes the consideration of such conditions as corneal surface keratoconus, subluxation of the lens, a structural defect within the eye, a lesion in the anterior visual cortex or non-organic conditions, however diffraction-based (rather than geometrical) optical models have shown that common optical conditions, especially astigmatism, can also produce this symptom. Temporary binocular diplopia can be caused by alcohol intoxication or head injuries, such as concussion (if temporary double vision does not resolve quickly, one should see an optometrist or ophthalmologist immediately). It can also be a side effect of benzodiazepines or opioids, particularly if used in larger doses for recreation, the anti-epileptic drugs Phenytoin and Zonisamide, and the anti-convulsant drug Lamotrigine, as well as the hypnotic drug Zolpidem and the dissociative drugs Ketamine and Dextromethorphan. Temporary diplopia can also be caused by tired and/or strained eye muscles or voluntarily. If diplopia appears with other symptoms such as fatigue and acute or chronic pain, the patient should see an ophthalmologist immediately. Some people are able to consciously uncouple their eyes, either by over focusing closely (i.e. going cross eyed) or unfocusing. Also, while looking at one object behind another object, the foremost object's image is doubled (for example, placing one's finger in front of one's face while reading text on a computer monitor). In this sense double vision is neither dangerous nor harmful, and may even be enjoyable. It makes viewing stereograms possible. Monocular diplopia may be induced in many individuals, even those with normal eyesight, with simple defocusing experiments involving fine high contrast lines. Diplopia has a diverse range of ophthalmologic, infectious, autoimmune, neurological, and neoplastic causes. Damaged third, fourth, or sixth cranial nerves, which control eye movements. Diplopia is diagnosed mainly by information from the patient. Doctors may use blood tests, physical exams, computed tomography (CT) or magnetic resonance imaging (MRI) to find the underlying cause. If diplopia turns out to be intractable, it can be managed as last resort by obscuring part of the patient's field of view. This approach is outlined in the article on diplopia occurring in association with a condition called horror fusionis. ^ a b c d O'Sullivan, S.B & Schmitz, T.J. (2007). Physical Rehabilitation. Philadelphia, PA: Davis. ISBN 978-0-8036-1247-1. ^ Blumenfeld, Hal (2010). Neuroanatomy through Clinical Cases. Sunderland MA: Sinauer. ISBN 978-0-87893-058-6. ^ Rucker, JC. (2007). "Oculomotor disorders". Semin Neurol. 27 (3): 244–56. doi:10.1055/s-2007-979682. PMID 17577866. ^ a b Kernich, C.A. (2006). "Diplopia". The Neurologist. 12 (4): 229–230. doi:10.1097/01.nrl.0000231927.93645.34. PMID 16832242. ^ Fraunfelder FW, Fraunfelder FT (September 2009). "Diplopia and fluoroquinolones". Ophthalmology. 116 (9): 1814–7. doi:10.1016/j.ophtha.2009.06.027. PMID 19643481. ^ "Diplopia - Eye Disorders - Merck Manuals Professional Edition". merck.com. Retrieved 27 March 2018. ^ "An Overview of Double Vision". WebMD. Retrieved 2018-09-23. ^ Phillips PH. (2007). "Treatment of diplopia". Semin Neurol. 27 (3): 288–98. doi:10.1055/s-2007-979680. PMID 17577869. ^ Taub, M.B. (2008). "Botulinum toxin represents a new approach to managing diplopia cases that do not resolve". Journal of the American Optometric Association. 79 (4): 174–175. doi:10.1016/j.optm.2008.01.003. Fraine L (2012). "Nonsurgical management of diplopia". The American Orthoptic Journal. 62: 13–8. doi:10.3368/aoj.62.1.13. PMID 23002469. Look up diplopia in Wiktionary, the free dictionary.